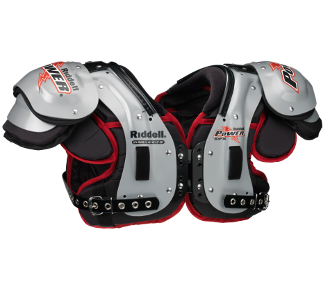 Any player whose value comes from their speed and agility will love the Riddell Power SPX Adult Football Shoulder Pad – RB/DB. Recommended for running backs and defensive backs its streamlined design includes short swim cut arches and swivel fronts that help these pads shift in union with your natural body movements. Riddell’s air management system keeps your body from overheating by providing maximum ventilation. The 1” BIOTHANE belt, front deltoid pads and STAC shoulder system won’t slow you down, all while providing you with the superior protection Riddell is famous for!